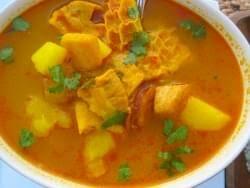 Mondongo - Tripe Soup - Tienditadepuertorico.com - Buy Puertorican Food Here!! simmer for about 2-1/2 hours, or until the tripe is tender. Drain and rinse. 2 In a clean pot, heat the oils. Add the ham, recaito, tomato sauce, and alcaparrado. heat, and simmer for 40 minutes, or until the root vegetables are cooked. them 5 minutes before serving.